Published Sunday, September 5, 2010, OK personal/derivative use; link www.lovethatimage.com. 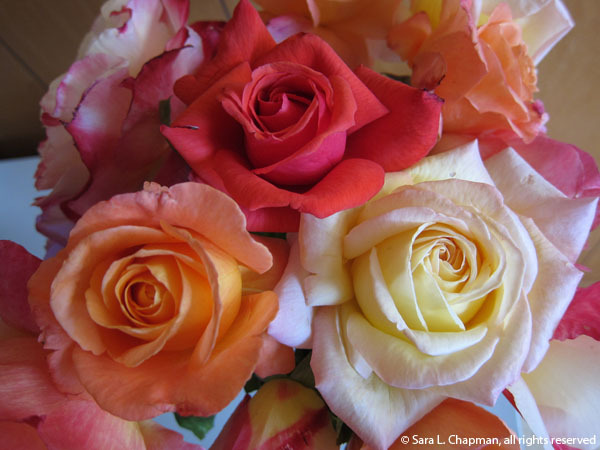 Here’s a bouquet of roses I picked for my cousin Sheila who is visiting. If only you could smell the fragrance! The top dark orange one is Dolly Parton (love that name! ), the yellow one is Peace, and the apricot one is Sundowner, I’m pretty sure. One day, I hope in my lifetime, there will be a device attached to your computer which will emit odors. Good smells only, of course. After all, if there’s enough computing power, why not? Fragrance is only molecules wafting towards us. In the meantime, you must imagine. Visit Mellow Yellow Monday, Color Carnival and Macro Monday for more of the same, and SOOC has more straight out of the camera shots. And you might try a search for bouquet here, always returning to the full blog by clicking on Sara’s Fave Photos above. Nice roses, Sara. I miss the Wordless Wednesday thing too. I get the feeling that the blog isn’t monitored very closely. I’m going to be starting a new photography link set-up, hopefully, next Saturday called “Foto Finish.” I hope you’ll check in next Saturday when I get it up and running. I love seeing everyone’s images, and it’s fun for me to post too. Wordless Wednesday is great. Mine will be a little different twist, so stay tuned and take good care. I do like the soft colouring of the Peace rose. and how tightly woven the petals are. Not sure about the aroma emmission from a computer. Just imagine what hackers would do with that!! I love the apricot one best! How gorgeous, I close my eyes and just imagine the fragrance. Mmmmmmmmmmm, this takes my breath away. Just love this picture. Wonderful roses! What a brilliant idea for a computer that emit the odour !! It’s possible, of course! an incredible riot of color and pleasurable fragrance. did you pick them from your garden or from the florist. Your cousin is lucky to have such a thoughtful cousin. These are from my garden. It’s hard to find roses like this in a florist, which is a shame. She is a wonderful cousin and friend, but I picked them for her! wow lovely roses you got here. Roses are such great photo subjects. I love roses like these, with tons of fragrance.